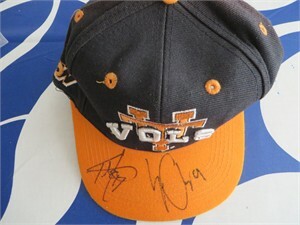 Tennessee Volunteers embroidered cap or hat autographed on the bill by former star quarterbacks Erik Ainge and Tee Martin. Both autographs obtained in person, with certificate of authenticity from AutographsForSale.com. ONLY ONE AVAILABLE FOR SALE.